A collector doesn’t have to spend too much time on eBay before running across an auction listing whose banner heading touts “Etched, pre-prohibition shot glass, VERY RARE, NO RESERVE!!!" Your heart quickens as the modem chatters and the page slowly loads, only to scroll down to find the most common of all pre-pro glasses, a lowly Hayner. 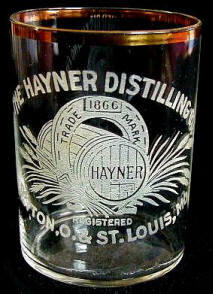 You curse the day the word “rare” was applied to anything other than prime rib, but also wonder just how rare or common well-known glasses from The Hayner, Kellerstrass and Detrick Distilling Companies actually are. This edition of Random Shots attempts to answer such questions by presenting a “Top 10“ listing of shot glasses, ordered by frequency of appearance. It also considers how familiarity with a common glass has a way of breeding contempt that is often undeserved. The Top 10 list is presented below. The data are derived from a comprehensive five-year record of glass sales from online auctions and other sources that, as of writing, includes over 10,000 individual transactions. The complete record can be accessed online at www.pre-pro.com, although a membership fee is required for access (trial memberships are available). 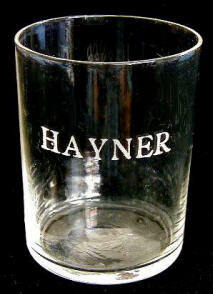 It will come as a surprise to no-one that our lowly Hayner heads the Top 10 list, although I hadn’t appreciated just how common this glass is until I’d crunched the numbers. After doing the math, it's clear that it out-strips all other pre-Pro glasses by a factor of almost two to one, appearing for sale at least once per week on average. Current value is around $13.25.